And no the little buddy is not a girl; it’s a boy who is skateboarding with his mom. How rad is that for a mom to teach her son how to skateboard – well they are actually learning together – that’s even radder! 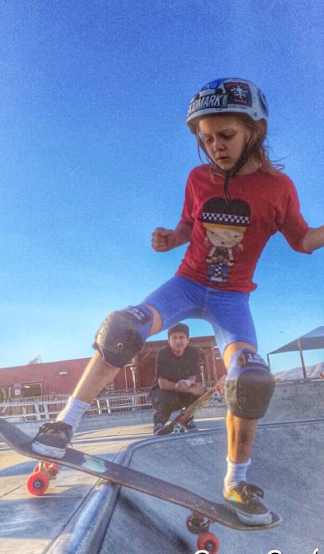 He’s five and actually has a twin but skateboarding is something he & his mom share. I think they are both lucky to have found skateboarding. I’m not worried about his twin – with a mom this rad I’m sure they share something equally special. Really appreciate Giovanna sharing this picture and story with me – I hope it inspires many other moms to give skateboarding with their child a try. Remember you don’t have to be a super shredder to skate together, you just have to be willing to have fun together! Cheetahzita doing a sit-down slide 180. Sliding is the most effective braking technique for downhill skateboarders – or so says Google. I went out with Arbor Girl friends last Sunday. After hitting a few parks – which I call home – we went to a hill. They called it a hill – mountain is what I’d call it. I had the borrowed gloves on and a loaner down hill skateboard by my side – but the idea of trying on a “hill” with a guardrail and cacti to land in – NO NO! I gotta keep it fun – so I’m going to try sliding on flat land. I know that’s not the end goal – I want to celebrate the process and work my way up the hill. I’m totally intrigued by the gloves but it’s all so new & different from how I’m used to skating. So here’s a big shout out to all my friends who are already going down hill – “masters of squat” is what they are. And a reminder that your real friends will encourage you to try new things – not force you! Encouragement is stylish on & off the board – peer pressure and bullying are never stylish. So grateful to have supportive friends that will help me learn downhill skateboarding “safely” – like is there even such a thing as downhill skateboarding “safely”? Okay help me learn downhill skateboarding with confidence! 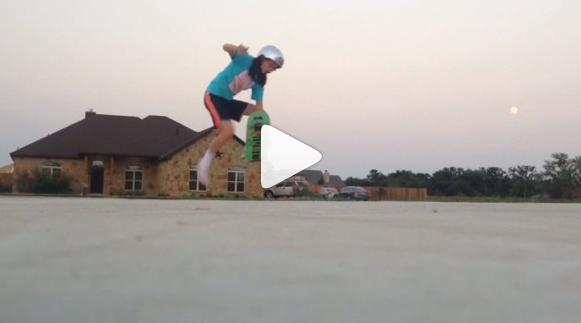 Madelyn092 has a passion for skateboarding. Apparently she also has a passion for fashion as she’s a Shop3Thirty supporter. I’m glad Madelyn shared this picture because I love when girls take the time to share their passions and encourage others. It’s surprising how busy you can get with a passion – you love it, you’re good at it, you do it a lot – and there goes the time. So here’s a big shout out to all the girls who make the time to encourage and help other girls both on & off the board! And yes – it’s good to encourage & help boys too – we are all people and everyone deserves kindness & respect. 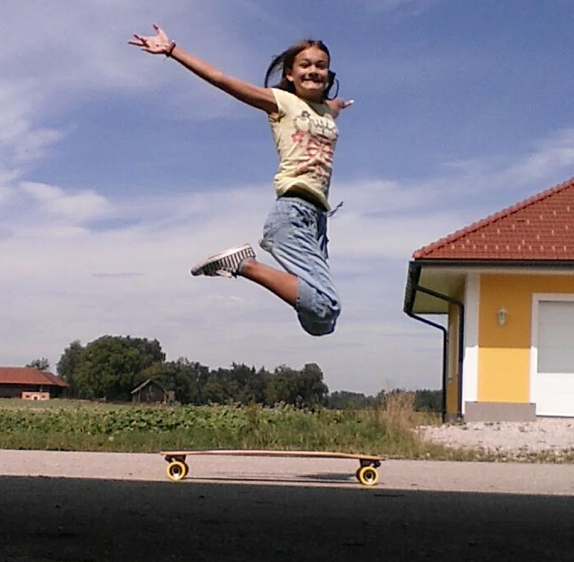 This is supergirl_poower – Rafaela has some serious air in this shot. And yes I want to believe she landed it and rolled away. 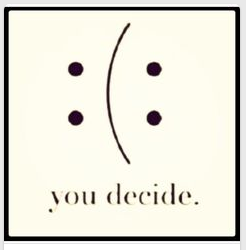 Being optimistic is a choice. Why not make it? It just feels better to face the world with a positive vibe – both on & off the board. I skateboard for fun but I take my fashion quite seriously. What I mean by that is fashion or what I wear is an expression of who I am and what I believe in. I only wear what I feel good about wearing – so if there’s a trend and everyone’s wearing it – you’ll only see me in it if I’m feeling comfortable in it. I don’t think clothes have to be dramatic or edgy or uncomfortable or anything else to be fashionable. I think clothes need to work with you – the old saying “wear your clothes don’t let your clothes wear you” is gospel to me. So t-shirts – fashion or not? Fashion 100% and a billboard for what you believe in. One artist who agrees is Jacky Wasserman – she’s a graphic designer and LA DJ who’s brought her life’s passions: design, food and music to life in her clothing line Beet x Beet. Jacky was a skater girl in New York skating at Chelsea Piers Skate Park near where her father lived. 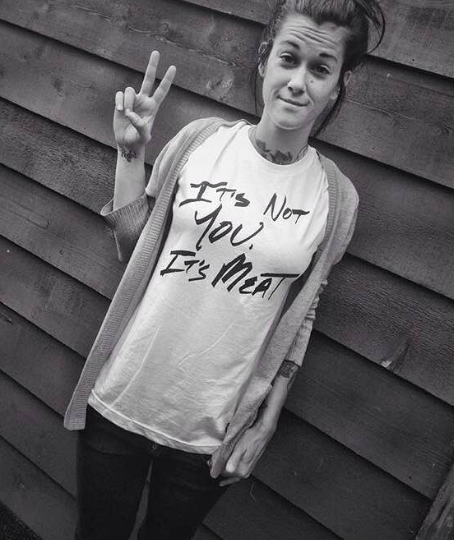 She’s a Vegan and uses her clothes to inspire others to consider the Vegan option. And yes before we begin the interview – I am not a Vegan – I’m not a Vegetarian – I’m not even a healthy eater. But I respect people’s diet choices. I don’t think what you eat makes you “good” or “bad” – I believe you should have the freedom to eat as you choose and that all life – including plants & animals should be treated with respect and kindness. I respect and admire people who stand up for what they believe in while treating others with respect – it’s always better to be introduced to new ideas in an atmosphere of fun. So here goes Skatingfashionista interview with Beet X Beet founder Jacky. with idea to make it more meaningful? seeing the numbers rise as far as demand in restaurants etc. portion of our proceeds go to an organization of choice. 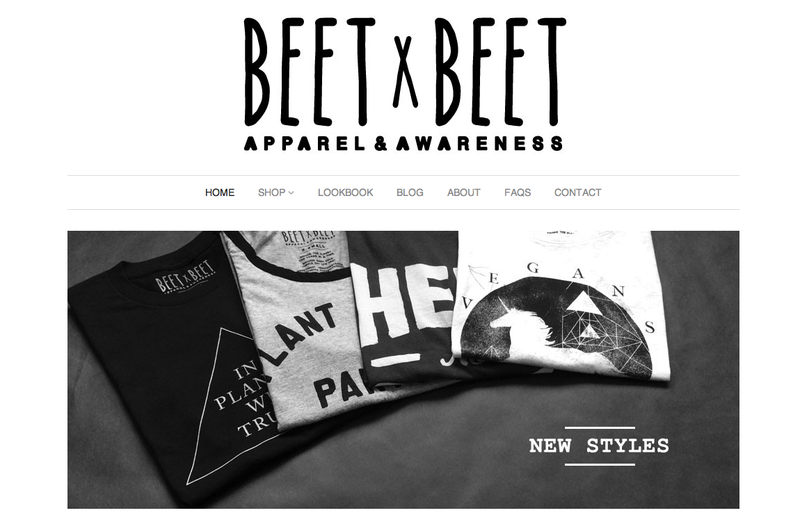 Above a happy customer of Beet X Beet – tangue. And to me that’s what fashion should do – make you happy – inspire you to have the best day possible in your skin & what you’re wearing. And if fashion educates you – bonus – thanks skateboarding for introducing me to Jacky & Beet X Beet hope to see her and more of her t-shirts soon! Would absolutely love if girls sent/tag me pictures of themselves skating in Beet X Beet t-shirts – more girls do skate as they see girls skateboarding and we encourage each other! And yes Jacky – I am encouraging you to get on a skateboard soon! Believe it or not this is someone’s first day skateboarding. When volumatic said first time on a skateboard, nailing it with style. He described it perfectly. She’s one seven year girl who was born to skate. 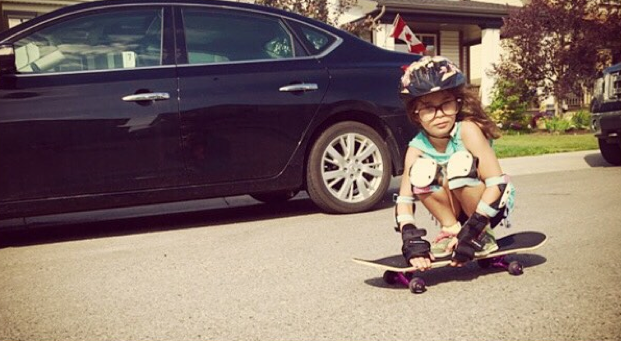 She’s nailing it in Alberta Canada and already encouraging other girls to skate. Skateboarding doesn’t come naturally to everyone but if you’re patient it will come. Encouraging doesn’t come naturally either but the world is a better place when it does. When you encourage someone you help them and yourself grow in confidence and hope. If every skater just inspired one other skaters who inspired one other skaters – imagine how happy the world would be. Keep it stylish on & off the board by being rad and encouraging radness! This is littlesurfergirl_ and if you follow the link you’ll see her first drop in at Aura Skateboarding Company in Vista. She’s committed to LIVING! Surfing, Skateboarding, Sunsets, Hotrods, Gratitude and Evolving! What a positive bio and way to live. Skateboarding is for all ages. Yes, we all get older but that doesn’t mean we have to stop learning and trying new things. Growing, evolving, learning are all super stylish on & off the board. Please keep sharing how you’re having fun skateboarding – more girls do skate as they see girls skateboarding and we encourage each other. Experts say it’s important for parents and children to bond – spend quality time together. What could be more quality than skateboarding together? I can’t think of anything either. 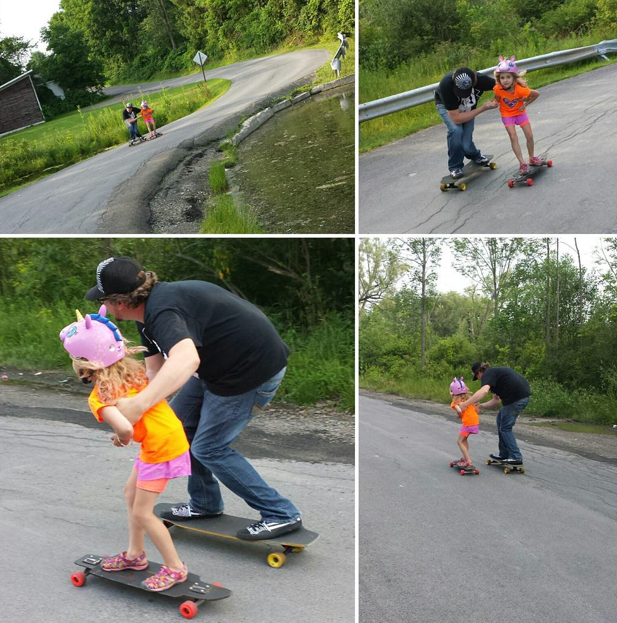 So you go giuseppe_mayart I love to see you sharing skateboarding with your daughter. What you focus on grows. When you skateboard together it improves both your skate skills and your relationship skills. 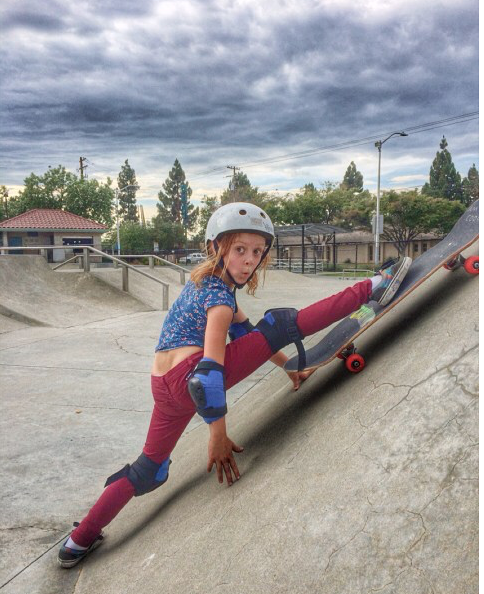 Just another reason skateboarding is fun for all girls at all levels in all places! And love the stylish helmet – if you gotta wear one make the most of it! lilydeeeee captured the perfect picture of splits aka extreme staple gun at the Santa Clara Youth Activity Center. If you’re not flexible when you start skateboarding – you will be if you stick with it. Skateboarding is all about the balance so you’re working your core muscles. Skateboarding is also super creative – there are endless ways to stretch & challenge yourself. Till next time keep it stylish on & off the board! 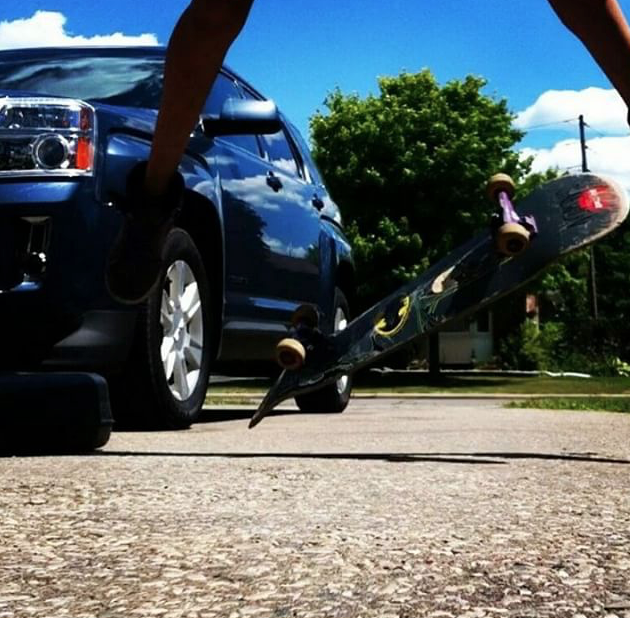 Skillest_sk8er took the time to share this picture with me & tell me a little about her skate story. She’s been skating since she can remember – like before she was five. 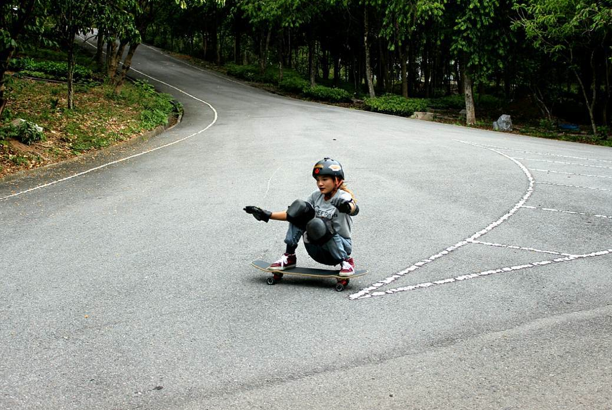 She got her first board from her mom – who saw that her daughter didn’t have a love for girly things. She had an immediate love for her skateboard. Unfortunately where she lives in Canada she can’t get to skate parks easily. Plus they are strict about kicking skaters out and even charging people for skating – so her skateboarding style is limited. Skateboarding shouldn’t be a crime – however it is in many places around the world. You can get stopped, fined, or worse for skateboarding in some places. I’m not going to say – so “don’t skate” – I’m not a fan of “don’t”, “never”, “can’t” and other words that limit. I say be aware. It’s important to stand up for what you believe in just be aware of the consequences – a fine is a hassle when it goes on your record it can be a real problem when applying for jobs – so decide is the risk worth it before you skate. And if skateboarding means a lot to you take time to support parks. There are foundations like Tony Hawk Foundation who’s purpose is to create public skateboard parks. Use your voice to say you want skate parks – there aren’t fines for asking and petitioning your community to build a park. Parks aren’t built overnight but when enough people act and are the change they want to see, change does happen. That’s why I always have time to share girls pictures and stories of where they are skateboarding. We are stronger on & off the board when we work together.